Latasha had no idea the cops would just start shooting. There were no warrants out for their arrest. No one in the car was armed. They were just three black friends driving home from a club through a rough part of Miami. They’d each had small run-ins with the law, but the officers knew nothing about the car’s occupants when they pulled them over. 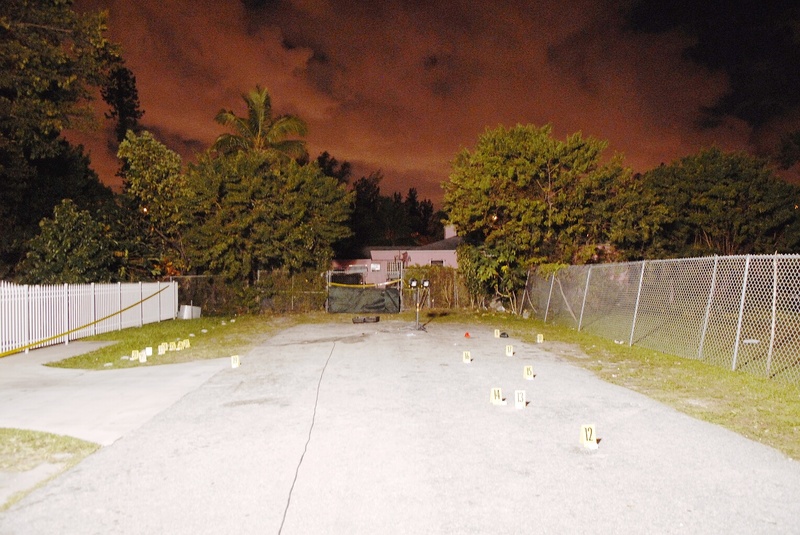 The cops tailed them into a dead end, pulled their guns, and seconds later the two Miami-Dade officers started shooting. Though the officers would later testify that they thought the car was backing up toward them, none of the 27 shots were fired into the back of the vehicle. Latasha’s boyfriend, Michael Knight, was celebrating his 21st birthday that night — he was shot three times and died just after being transported to a local hospital, where his mother was a nurse. Their friend Frisco Blackwood, also 21, was shot eight times and died while still sitting in the driver’s seat. Latasha was left to crawl out of the vehicle, with a bullet lodged in her thigh, wondering why the cops had opened fire. It took seven years for Latasha to get her day in court, years during which her life would derail. But during her civil trial against the officers in 2014, the officers’ attorneys obsessively focused on her criminal record, which had nothing to do with the facts of the case. The trial became a debate over Latasha’s integrity: Over the course of two weeks, the lawyers referred to Latasha as a convict some 32 times. They even brought up arrests that happened years after the shooting. Not only is this kind of questioning legal, it’s a common strategy in police abuse cases — and some attorneys even say it’s one of the biggest barriers to police accountability. A VICE News investigation has found that a rarely examined federal rule lets police attorneys effectively smear victims of police violence in civil trials, and further tilts the scales of justice in favor of the police. This rule — known as 609 — is so broad that it can allow attorneys to bring up almost any aspect of a plaintiff’s criminal record at trial, no matter how trivial or how unrelated to the facts of the case. VICE News interviewed more than 75 lawyers, advocates, and judges, and examined every federal excessive force civil rights lawsuit filed against police in 2009, the year Latasha filed her case. That year, 200 such cases were brought. Many of those cases were dismissed or settled; others didn’t involve 609 evidence or a judge excluded the evidence. But across the country, 10 cases that allowed evidence of a plaintiff’s criminal history did ultimately go to trial. The evidence included details of minor drug possession, fleeing police, and, in one instance, a traffic violation. In one case, a group of Syracuse, New York, police allegedly beat up a man after he refused to let the officers search his car. In another case, two Chicago officers allegedly shoved a man against a metal fence while he was walking to a local barber shop. Seven of those 10 cases were decided in favor of police. The frequency of lawsuits against police officers has only increased since Latasha filed her case, amid an intensifying national debate over policing and race. But conversations with dozens of attorneys, victims, and academics — and a review of hundreds of cases — suggest victims of police abuse with criminal records face long odds to hold police accountable. Criminal prosecution for police violence is extremely rare. Victims and their families instead must turn to civil courts for justice. But beyond a few multimillion-dollar settlements in high-profile cases, routine police violence rarely leads to favorable outcomes for victims — in part due to the broad influence of Rule 609 in civil courts. Federal Rule of Evidence 609 applies to all witnesses — in fact, it’s ingrained in how we think about justice. The spirit of the rule dates back to the Common Law era, when people with criminal records were deemed “unworthy of belief.” It wasn’t until 1917 that Americans with convictions were even allowed to take the stand at trial. Congress and the judiciary branch formally codified this practice under Rule 609 in 1975. Now, “crimes of dishonesty” such as perjury and fraud are automatically admitted as evidence and judges have discretion over whether to allow felony convictions up to 10 years old. Police attorneys see Rule 609 as an important tool to protect their clients from frivolous lawsuits. But in trials involving police misconduct, an entire case can rest on a victim’s word versus a police officer’s. Before her trial started, Latasha thought her word would count equally. The jury was allowed to hear in great detail about all four of her convictions, for bank fraud and grand theft. Not so for the officers’ disciplinary records, which the judge refused to allow into evidence — one officer, Ryan Robinson, had a disciplinary file that included two off-duty DUI car crashes in April 2014. In one crash, he injured two girls in a supermarket parking lot. After a 10-hour jury deliberation, Latasha lost her case 7-1. After the decision was announced, she ran out of the courtroom, went into her car, locked the door, and cried. On the day after the trial, Robinson got into two separate hit-and-run accidents while driving with a suspended license. He was asked to resign from the Miami-Dade police force the following year. Today, one in twelve American adults has a criminal record; for black men, it’s one in three. Even after they’ve served their sentences, felons are barred from voting in 10 states, are denied housing and often prohibited from collecting food stamps, and are dismissed by law or prejudice from many forms of employment. And they continue to face intense bias in the courts, where they are vulnerable to Rule 609 evidence if they decide to sue for any reason — say, over a work-related injury, as in the case of a 1989 Supreme Court ruling that solidified Rule 609’s place in the justice system, or a police shooting. The facts of Latasha’s life and the outcome of her case — largely due to the impact Rule 609 — show just how difficult it can be for victims of police violence to get justice. (L) Latasha in high school. 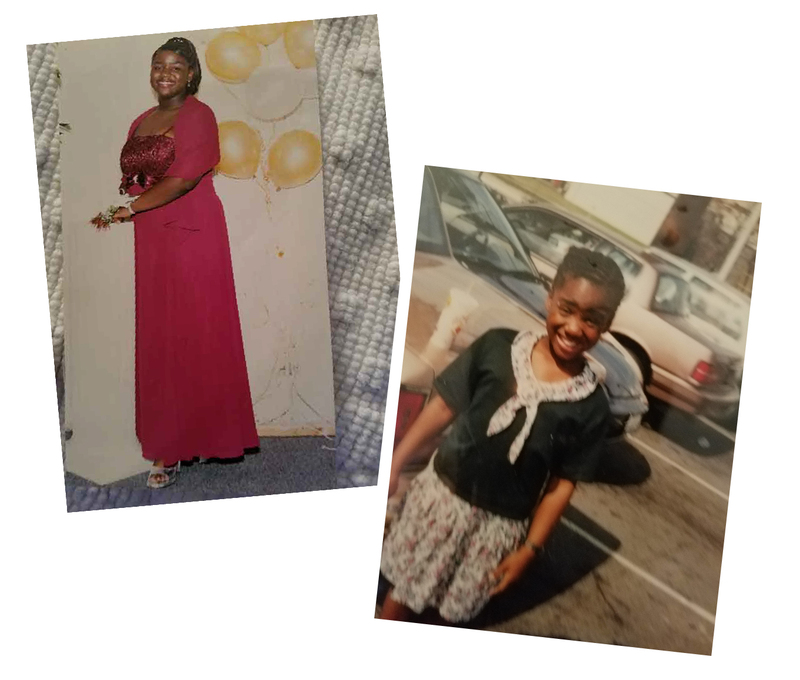 (R) Latasha as a child. Courtesy of Michael Cure. 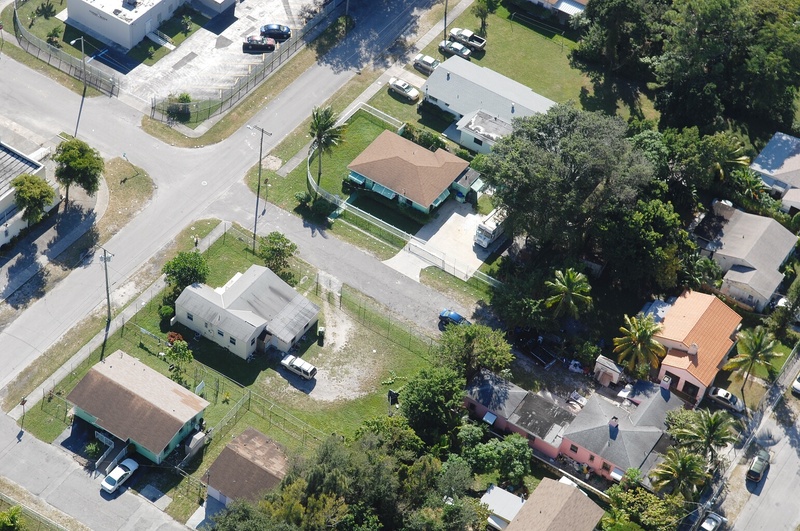 Latasha grew up in Miami’s north side, where auto repair shops line the two-lane avenues and palm trees tower over the small, ranch-style duplexes that sit behind chain link fences. Most people she knew in the area had been arrested at least once. She lived just a few blocks away from where her friends lost their lives. Crime in the area is high, and so is police presence. 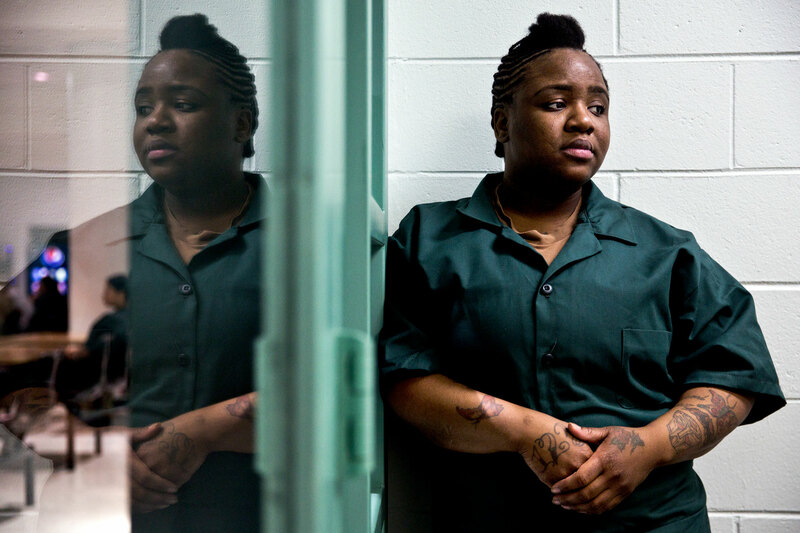 Her first conviction came when she was 23. She was pulled over for speeding, and when the officer searched the car, he found a purse with several stolen IDs inside. The judge gave her probation. The shooting was only eight weeks later. That night, Nov. 12, 2007, around 10 p.m., she and Michael piled into their friend Frisco’s rented Cadillac SUV to head home. Frisco was complaining that he had to get up early the next day to testify for a friend who had recently been shot. From the back seat, Latasha wondered if they could smoke some pot before they went to sleep. They were close to Latasha’s house when a police car began to tail them without its siren lights. They panicked, unsure of what to do, and Frisco kept driving. Latsha remembers thinking the worst that would happen was they might get in trouble for hanging out when they were all on probation. “I would have never in a million years think that the police would have shot, considering they didn’t know who was in the car,” she said. Five blocks later, both cars stopped at a dead end and two officers got out with their guns drawn, yelling for the friends to show their hands. There was no way to escape the 27 bullets that came next, but they tried. As the officers started shooting, Latasha crouched down into the small legroom space in the back seat, screaming at Frisco and Michael to do something. Frisco had put the SUV in reverse, but a bullet hit him in the head and his body slumped to the side as the SUV careened backward. Michael opened the passenger door and his body fell out of the car and onto the asphalt. The officers kept shooting at the front windshield as the SUV, still rolling backwards, crashed into their car and came to a stop at a fence across the road. The whole incident lasted less than a minute. Latasha crawled out the back-seat window and the officers ordered her to lie on the ground and handcuffed her. Michael was dying and Frisco was already dead, their bodies full of bullets. 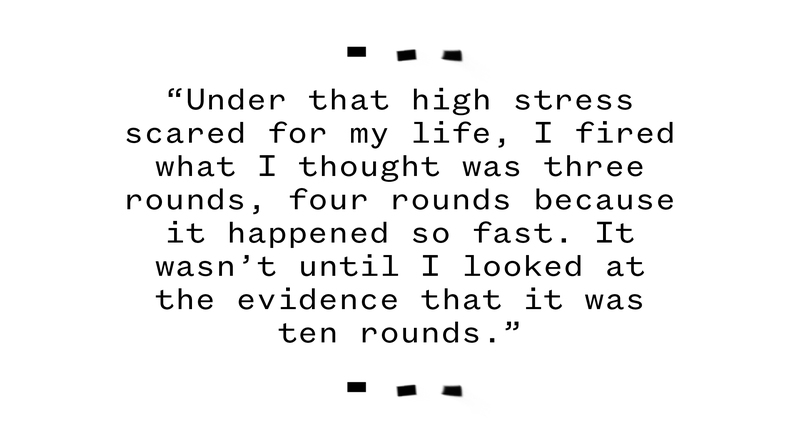 Latasha realized she was bleeding; she’d been shot in the thigh. The officers — both declined to comment for this story — told a different story about that night: They shot at the car in self defense. Ryan Robinson, then 34, was a four-year veteran of the Miami-Dade police department, rode in the passenger seat of the cop car. Michael Mendez, the driver, then 24, was in his second year on the force. They were on robbery patrol that night, which meant they were out looking for suspicious activity. They told investigators they followed the Cadillac SUV for several blocks, and when the driver ran a red light, they chased the vehicle into the dead end. They thought the driver was fleeing, so they drew their guns as they approached the stopped car. They could see three people inside but not much else. Then the car suddenly jumped backward, hurtling toward them. They thought the driver was trying to run them over by reversing, so they shot in self-defense, they said. Throughout the trial, both officers stressed they had no option but to defend themselves by shooting at the car. Twenty-four of the 27 bullets the officers fired hit the SUV or the three bodies inside. None entered through the back of the car. The police-department panel that reviews officer-involved shootings exonerated both officers, warranting “no further action,” and the state attorney’s office cleared them of any criminal wrongdoing the following year. As the only survivor of the shooting, it was Latasha’s word against theirs. 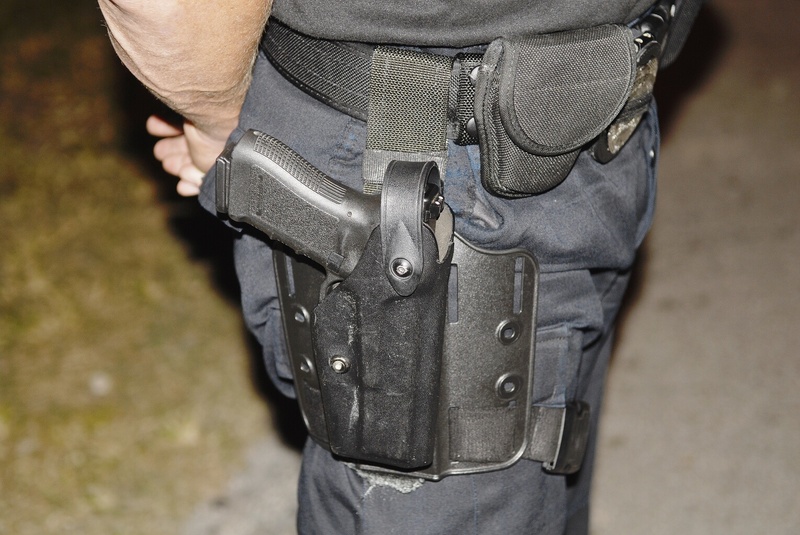 At first, the Miami-Dade officers tried to get Latasha’s lawsuit dismissed on grounds of “qualified immunity.” Courts shield public employees from liability in civil rights lawsuits unless the plaintiff can prove the employee knew they were violating the plaintiff’s rights. Qualified immunity can protect police officers who say they felt threatened and therefore weren’t breaking the law when they shot to kill. It’s the reason most lawsuits against cops go nowhere. The other big reason cases against cops fail, according to attorneys around the country, is Rule 609. A Chicago attorney told VICE News that he includes Rule 609 evidence on the intake form he reviews with potential clients because it can be such a big factor in winning a case. Several attorneys said it affects their decision about whether to take a case at all. Latasha’s attorney, Benedict Kuehne, said he knew Latasha’s grand theft conviction might come up, but he didn’t think her past would outweigh the evidence. A few stolen IDs was nothing compared to 27 shots fired at three unarmed kids who were just trying to get home from a club. “They had their blemishes, but I made a decision that they were entitled to the same kind of justice as everybody,” Kuehne said. If a case overcomes qualified immunity — as Latasha’s did — the next step is to try to negotiate a settlement. Police lawyers may use a victim’s criminal history to argue for a low settlement amount, or decline to settle at all, knowing Rule 609 lets them challenge the plaintiff’s credibility in front of a jury. But it’s trial testimony that offers the best chance for police attorneys to smear the plaintiff using her criminal record. Judges give jurors instructions on how they should interpret Rule 609 evidence, cautioning them to consider it only to assess the witness’s credibility, not whether she deserves to win the case. But that line of thinking is hard for jurors to follow, according to interviews with lawyers, judges, and decades of social science research. 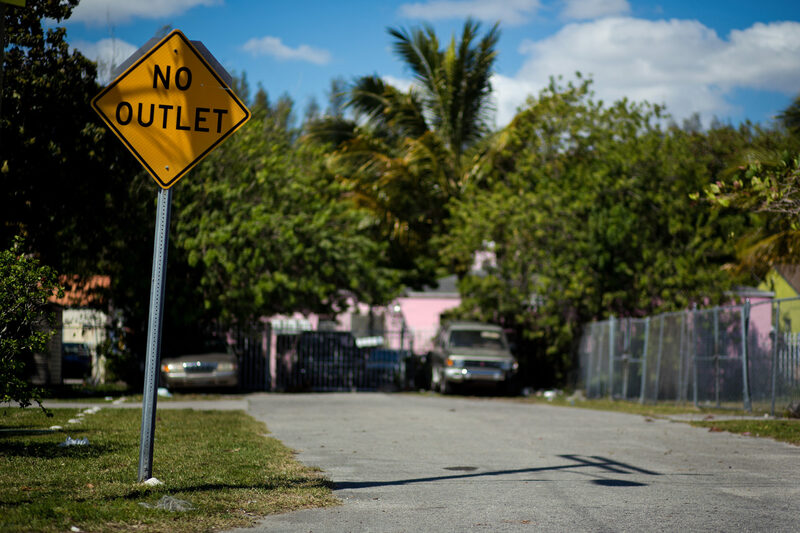 Kuehne and the police lawyers couldn’t reach a settlement, and as Latasha’s case dragged on, she found herself back where she started in North Miami, with few prospects and unshakable guilt about the shooting. She kept wrestling with the question of why she was the one to survive. Latasha eventually moved into a duplex with a friend, and met her current boyfriend. She worked occasionally at his mom’s hair salon cleaning up and helping customers. Things were going well, so in 2013 they decided to have a baby, a girl they named Denbree, and then another daughter, Deliah, later that year. Then Latasha’s boyfriend got into trouble for driving with a suspended license and he was in and out of jail for several months. Latasha turned to scams she had learned from friends in the neighborhood — using fake IDs and forging checks — to support him and the kids. “It was the only thing I knew how to do,” she said. By the time her civil rights trial started in 2014, Latasha had three more convictions on her record. The odds against her were growing. Knowing the potential impact of Rule 609 evidence, Kuehne asked the judge to exclude Latasha’s record from the trial. After all, three of her convictions didn’t come until after the shooting. But because the new convictions were for a false bank check and ID fraud — crimes of dishonesty — they were automatically allowed in for the jury to hear. At the request of the officers’ lawyers, the judge allowed in Latasha’s grand theft conviction, too. Latasha said Kuehne warned her about how the police attorneys might use her record, but she still found the focus on her past upsetting. One of the police attorneys, Bernard Pastor, even brought up Frisco’s burglary conviction. Kuehne also asked the judge to allow Officer Robinson’s police department disciplinary record into evidence in an effort to balance the Rule 609 evidence against Latasha. Because those disciplinary records weren’t criminal convictions, the judge wouldn’t allow it. In a way, Pastor is right. The impact of Rule 609 is not inevitable; it’s a policy choice. States unhappy with the federal standard have changed their own guidelines about criminal history evidence to limit its influence — Montana doesn’t allow it at all. Some bias-conscious judges choose to exclude irrelevant bits of a plaintiff’s criminal history — or try to lessen the bias that Rule 609 evidence creates. Gertner, the former federal judge, let attorneys ask witnesses only one yes-or-no question about prior convictions. Latasha was asked about her record 50 times. The immediate impact of 609, however, is up to jurors. And because felons are barred from serving on juries, plaintiffs with felonies on their records won’t be heard by a jury of their peers. One juror in Latasha’s trial, who asked me not to use her name because she did not want to seem racist, told me that she did not find Latasha credible. Another said she didn’t remember the evidence about Latasha’s criminal convictions at all. Federal jury verdicts must be unanimous, but Latimore refused to budge. After 10 hours of deliberating, the judge asked whether the lawyers would accept a super-majority verdict rather than call it a hung jury. Both sides agreed and the jury foreperson announced the 7-1 decision: The officers acted reasonably when they shot 27 bullets at the SUV, killing Michael and Frisco and injuring Latasha. This is the dynamic Rule 609 reinforces: The people most likely to encounter police violence live in poor and minority communities that see the most policing. For the same reasons, those are the people most likely to have criminal records. And those convictions can all but guarantee that these people won’t get a fair shot at justice. Maria Cure, Latasha’s aunt, said pursuing the civil rights case for nearly a decade only to lose at trial took away Latasha’s self-esteem. “She feels like she was cheated,” she said. “They took a lot from her and out of her.” Latasha was convicted again of identity fraud last year and has three and a half more years of her sentence to serve. Her daughters, now 3 and 4, live with their father. Robinson continued to get in trouble with the department, including the two DUIs the day after the trial ended, and he resigned the following year. Mendez became a detective in the homicide unit in 2015. The department has since revised its use of force policy to explicitly ban shooting at moving vehicles, in line with national trends. Taylor Dolven is a reporter for VICE News. Alexa Liautaud and Morgan Conley contributed research.